Designed for commercial printers, in-plant printers, and binderies, the Standard Horizon AFC Series Floor Model Folders include advanced set-up automation, including gap settings, through a user-friendly color touch-screen control panel. Up to one hundred different jobs can be stored in memory with set-ups accomplished in as little as fourteen seconds. Precise stepper motors drive end stops and fold plates to the exact location for the sheet size and fold style selected. Reliable and high speed – An advanced rotary suction-feed system guarantees fast, smooth feeding of a very wide range of stocks. 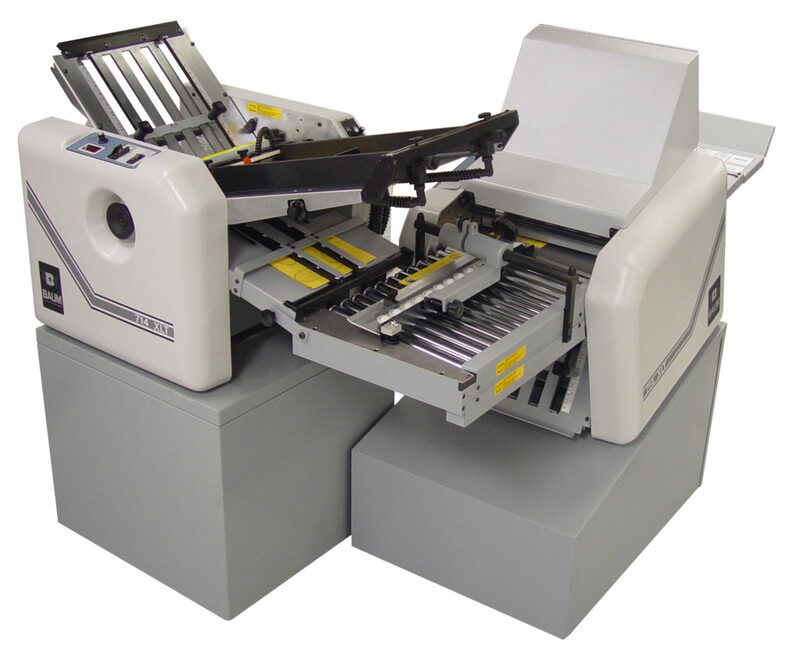 AF-406F + Right Angle – Fully automated 6-buckle folder with pile feed and suction head, and an optional 6-buckle second unit added with a right angle conveyor for pharmaceutical, small format, and direct mail applications for sheets folded down to .79″ x .79″. AFC-564A – The AFC-564-A computer-controlled folder combines superior feeding and registration with touch-screen control. Select from 14 pre-set folds or set up 200 custom folds. AFC-566FG – Floor model vacuum-feed folder features fully automated set-up, including gap settings, and 6 fold plates for a wide variety of folding applications. Stores up to 200 different jobs in memory with automated make-ready in 14 seconds. AFC-746F – Large-format folder with advanced set-up automation through a user-friendly color touchscreen control panel. Features quick changeover and fully automated setup with up to 47 automated adjustments. This entry was posted in Paper Folding and tagged AF-Series Folders, Horizon, Specialty Folding, Standard on March 13, 2017 by Billi Jean Johnstone. The Baum 714XLT is ready to go to work for you! The Baum UltraFold 714XLT air feed tabletop folder combines all the rugged reliability of the larger model Baum folders in a compact, convenient size. The 714XLT is ready to go to work for you anytime and anyplace you need it. It can easily handle coated stocks as well as high-speed copier and laser printed stocks. The 714XLT is not an automated folder but the set-up can be completed within minutes. You do not have to be experienced in operating a folder to run it. Check out the additional product features and advantages, including the set-up overview and the types of businesses that use the Baum 714XLT, when you click the link below. Learn more about the Baum UltraFold 714XLT and the types of business that use the Baum 714XLT by clicking here to go directly to our website. This entry was posted in Paper Folding, Vendor News and tagged 714XLT Folder, Air Feed Tabletop Folder, Baum, Baum UltraFold, Paper Finishing, Paper Folding on May 6, 2016 by Billi Jean Johnstone. Standard’s paper folders are truly unique; you simply cannot find more user-friendly, productive, and reliable folders. Each one offers superior paper feeding across an extensive range of paper stocks. Desktop models offer easy fold roller and feed roller access for simple operator maintenance. The innovative compact design of Standard desktop folders makes them suitable for almost any location, particularly those with sound level or space limitations. The Standard Horizon EF-35 provides a clear choice for tabletop suction feed folding needs. Capable of folding 30,000 sheets per hour, the EF-35 delivers both command and control to the operator for every folding job. Complete with combination rubber and steel folding rollers and self-compensating gapping, the EF-35 is as easy to set up as it is to operate. The steel folding rollers encompass horizontal machining found on paper folders that can cost 4-5 times more, the grooving on the rollers provides positive sheet grip while minimizing scratching and scuffing on today’s advanced digital stocks. This unique folder, serves the traditional print markets as well, with its great range of stock capabilities and productive throughput. The Standard Horizon PF-40L combines high-volume suction feed capabilities with intelligent automation. A 1,000 sheet capacity top-fed system provides reliable mark-free feeding of digitally printed sheets. The PF-40L’s push-button control panel enables any user to set-up for the six most popular fold patterns of standard cut-sheet sizes. The paper size range for the PF-40L is from 5” x 5” to 12.6” x 24.8” and thicknesses from 13 lb. bond to 60 lb. cover without requiring pre-scoring or creasing. Memory capacity allows for easy programming of ten unique fold patterns and/or non-standard sheet sizes to be recalled at any time. This entry was posted in Paper Folding on August 4, 2014 by MSL. High Quality in a Compact Body! 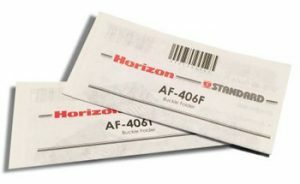 The Horizon PF-40L handles wide range of paper stock with suction rotor feeding with accurate sheet registration that leads to high quality folding. The PF-40L combines high-volume suction feed capabilities with the intelligent automation that Horizon products are so well known for. The 1,000 sheet capacity top-fed system is the same suction feed system as is used on both the highly popular VAC Collators and PF-P330 Folder providing for reliable mark-free feeding from static laden digitally printed sheets as well as conventional prints. The PF-40L’s push-button control panel enables any user to set-up for the six most popular fold patterns of standard cut-sheet sizes. The paper size range for the PF-40L is from 5” x 5” to 12.6” x 24.8” and thicknesses from 13 lb. bond to 60 lb. cover without requiring pre-scoring or creasing. Memory capacity allows for easy programming of ten unique fold patterns and/or non-standard sheet sizes to be recalled at any time. Additionally the built in registration guide table keeps sheets correctly registered at its highest operating speed of 390 sheets per minute. The rolling MT-40L base cabinet is included in the cost. This entry was posted in Paper Folding on May 12, 2014 by MSL. High performance and automation distinguish this space efficient cross-knife folder. The large color touch-screen provides simple, powerful user interface. The Continuous Feed Unit can be attached or detached to the folder without removing the standard flat pile feed table, making it quick and easy to interrupt long runs for a short-run job. An error feed tray is equipped for continuous feeding operation. Signatures are powerfully compressed for reduced bulk and tighter folds. Pressed stacks are automatically transferred to the bundling section for optimum efficiency and labor savings. Signatures are powerfully compressed for reduced bulk and tighter folds and can be offset separated individually or by group, depending on your job requirement. The computer-controlled gluing unit can produce neatly finished 8-page or 12-page glued booklets. The glue is suitable for recycling. High performance and automation distinguish this space efficient cross-knife folder. The large color touchscreen provides a simple powerful user interface. Automated setups take only a few seconds. All adjustments are user-friendly and require minimal skill or training. For additional product information or to request a demonstration, please call us or visit us online. This entry was posted in Paper Folding, Vendor News on February 19, 2014 by MSL. If you have the need to fold digital printed material the Baum 714XA AutoFold is your perfect solution. If you have the need to fold digital printed material the Baum 714XA AutoFold is your perfect solution. The 714XA is an easy to use, reliable, automated table top air feed folder specifically designed for the digital market. This heavy duty folder was designed and is manufactured by Baum in Sidney, Ohio USA. Baum continues to be the world market leader in tabletop folding machines with the 714XA. The 714XA is extremely easy to set up a new job. When you power up the 714XA the first thing you will see is the easy to read production screen. This is a touch screen control panel with color display and easy to follow pictographs. First you will select the type of fold that you want to make. Next you will enter the length of the sheet being folded. After selecting the length of the sheet, you will select NEXT on the screen. The lengths of standard paper sizes are shown and if you are going to fold one of these simply touch the appropriate one and it will turn blue indicating this is the size you have selected. On this screen you also have the option of selecting either inch or metric measurements. If the sheet size is different than one of the three standard lengths shown you can enter this figure manually. The initializing screen will appear to let you know that the fold pan stops are moving and that you have to wait until they are in position before you can do anything else. After the pans have reached the requested fold position, the Pans at Fold Position message will appear. After the pans have reached the requested fold position, the PANS AT FOLD POSITION message will appear. Press the button to start the job. For additional information, please visit us online at www.midstatelitho.net or click here to be directed to Baum 714XA webpage. This entry was posted in Paper Folding on January 28, 2014 by MSL. The DocuCrease is an entry-level hand creaser comes in 35cm and 52cm sizes and has adjustable stops for multi-creasing down the sheet. The Morgana DocuCrease is an innovative product designed and manufactured by Morgana to further complement our range of Document Finishing Machines. Creasing versus Scoring. Traditional rotary scoring machines use circular blades that are in constant motion as the stock passes through them. This creates a ploughing action that actually cuts through the top fibres of the paper or card in order to create a score. Inevitably this weakens the paper and encourages cracking. In contrast, the Morgana DocuCrease employs a unique creasing rule and matrix as illustrated overleaf, that eliminates tearing and, therefore, cracking. Available in two width sizes, 35cm or 52cm, the DocuCrease is solidly constructed to give years of trouble-free use. Both models offer many unique features and are ideally suited for short to medium creasing volumes. For additional product information contact MSL at 1-800-343-4231 or visit our website at www.midstatelitho.net. Our sales department can also be reached at sales@midstatelitho.net. This entry was posted in Paper Folding on November 26, 2013 by MSL. The ElectroCreaser is designed for the smaller printer or inplant, the ElectroCreaswer is available in 36 & 52cm widths with two creasing profiles. Easily set up to handle jobs needing multiple creases. Handles stock up to 0.015″ (approx 150lb cover)*. The ElectroCreaser is ideal for the smaller printer or inplant. A compact, table-top unit, it is fast to set up and simplicity itself to operate. Unlike scoring, which can damage card or paper, the Morgana blade and matrix method ensures a clean sharp fold without damage to the substrate. It provides 2 creasing widths as standard, 0.04″ and 0.06″ – with the ability to change from one to another in seconds. It also has a special “Super Speed” stop system, which greatly simplifies jobs that call for multiple creases. The creasing matrix is electronically activated by a foot switch for increased accuracy and productivity. For additional product information contact MSL at 1-800-343-4231 or you can reach our sales department at sales@midstatelitho.net. Visit our website at www.midstatelitho.net. This entry was posted in Paper Folding, Print Finishing and tagged Morgana, Paper Folding, Print Finishing on September 21, 2013 by MSL. The AutoFold Pro is an automatic folding machine designed specifically for the professional digital or litho printer who has the need to fold pre creased sheets. The AutoFold can be aligned to any Morgana or other manufacturer’s creaser to give perfectly folded results on a wide range of both digitally or litho printed stocks. Controlled by the same innovative 7″ SmartScreen panel as other machines in the Pro range, the AutoFold is instructed how long the pre-creased sheet is and which fold to produce. The beauty of the AutoFold Pro is its simplicty allowing the user of ANY manufacturer’s creaser to invest in one and to improve their productivity and quality immediately. This entry was posted in Paper Folding, Print Finishing on August 29, 2013 by MSL. Creasing versus Scoring. Traditional rotary scoring machines use circular blades that are in constant motion as the stock passes through them. This creates a ploughing action that actually cuts through the top fibres of the paper or card in order to create a score. Inevitably this weakens the paper and encourages cracking. In contrast, the Morgana DigiCreaser employs a unique creasing rule and matrix as illustrated overleaf, that eliminates tearing and, therefore, cracking. This entry was posted in Paper Folding, Print Finishing and tagged Creasing, Folding, Morgana, Paper Folding, Print Finishing on August 22, 2013 by MSL.